How can diabetes affect eye? Diabetes can affect the eyes and vision in a number of ways. It may lead to frequent fluctuations in vision, cataract in young age, decreased vision due to involvement of optic nerve, temporary paralysis of the muscles controlling the movement of eyes and thus double vision. The most significant complication of diabetes in eye is diabetic retinopathy and its complications. Non-proliferative or background diabetic retinopathy : When blood vessels in the retina are damaged, they can leak fluid or bleed. This causes the retina to swell and form deposits called exudates. This is an early form of diabetic retinopathy and may not lead to any decrease in vision, but it can lead to other more serious forms of retinopathy that affect the vision. Macular edema : The fluid and exudates collects in the macula (the part of the retina that allows us to see fine details), thus decreasing the vision. Sometimes there may be a macular edema without any loss of vision. Therefore it is important to have periodic checkup to detect and treat these conditions at an early stage. Proliferative diabetic retinopathy: This is an advanced stage of diabetic retinopathy, where the blood supply of retina is compromised. In response to this, new fragile blood vessels grow on the surface of the retina (neovascularization). These new vessels are very fragile and bleed easily. These may lead to serious vision problems if they bleed into the vitreous (the clear, jelly-like substance that fills the center of the eye) which is known as vitreous hemorrhage. This prevents the light from reaching the retina and thus can blur the vision. The new blood vessels and the bleed into the vitreous can also cause scar tissue to develop, which can pull the retina away from the back of the eye. This is known as retinal detachment, and can lead to blindness if untreated. In addition, abnormal blood vessels can grow on the iris (the colored part in the front of your eye, which can lead to glaucoma). 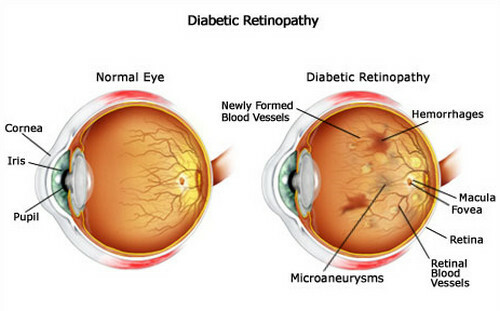 The longer the person has diabetes, the greater are his/her chances to develop diabetic retinopathy. Almost 80% of people, who have diabetes for 15 years or more, have some damage to the blood vessels in their retina. The other risk factors are high blood pressure, anemia, kidney diseases, and pregnancy. Can something be done to prevent diabetic retinopathy? There is no treatment that can prevent diabetic retinopathy altogether. Persons with any form of diabetes may develop diabetic retinopathy. But it has been proven that a good control of diabetes can delay and slow down the rate of progression of diabetic retinopathy and its complications. Besides a good control of blood sugar, one must exercise regularly, keep the blood pressure under control, avoid smoking, and avoid obesity. You might not know that you are having diabetic retinopathy, as there are no symptoms in the earlier stages of the disease. Therefore it is essential to have periodic evaluation of your eye by an ophthalmologist to detect the condition early. Early diagnosis and timely treatment is very essential in preventing the complications of this disease and thus maintaining vision. How frequently should I get my eye examined? If you have diabetes, you should get a yearly examination with your ophthalmologist. Your pupils may be dilated with eye drops, so that your ophthalmologist may have a good look at the back of your eye. Once you develop diabetic retinopathy, then your ophthalmologist will advise you if you need some investigations, treatment or just need to follow up. In these cases the frequency of follow up visits is decided on basis of the severity of the disease. What are the tests done for diabetic retinopathy? Your vision is assessed by the usual charts. The back of your eye is examined after dilating your pupils, using an instrument called ophthalmoscope. Sometimes your ophthalmologist may advise a special test called Fluorescein angiography. It is test in which a series of photographs of the retina are taken with the help of a special camera. These photographs are taken after giving the patient an injection of a yellow dye. This dye reaches the retina through the blood stream and helps in seeing the blood vessels of retina more clearly. This test helps the doctor to determine which areas to be treated with laser. The treatment of diabetic retinopathy is decided on the basis of the stage of the disease. In the very initial stages, it just requires periodic follow up to look for progression of disease. The ophthalmologist decides when to see a patient next depending upon the severity of changes in the retina. Laser Treatment : There are well-defined criteria for laser therapy. Laser therapy is done when there is significant maculopathy, or when there are significant new blood vessels in the retina or iris. Anti-VEGF agents (Lucentis, Avastin, Macugen) : These agents are being used in some selective cases alone or in addition to laser treatment or surgery.